If you have psoriasis, you’ve probably gone through thousands of moisturisers, tubs of white goo and other sticky substances, trying to find the one product that will keep your psoriasis flakes happy. Well, call off the search, because that product is none other than Vaseline – the simple, cheap, slippery gunk that everyone always walks past because it’s just too plain-looking. I’ve been using it almost exclusively for nearly 2 years now, and I don’t plan to stop any time soon. Not only is it as cheap as chips, costing around $2 for a 200ml tub where I’m from, but it’s one of the simplest skin products you can use on your psoriasis. It doesn’t contain any harsh chemicals, perfumes or parabens which make psoriasis act up; all it has is good old petroleum jelly. I even have a small 50ml tub of Vaseline mixed with cocoa butter that I keep at work! The only problem, and the reason why it has a bad rap, is that nobody uses it correctly. Vaseline is good at locking in moisture – it doesn’t magically moisturise your skin if there’s nothing already there. Consider it a sealant, like an anti-wetsuit that keeps moisture in instead of out. What it really needs to function well is water. 1. Wet your skin with water. This is essential to the process so make sure to do it! I normally slather it on straight after a shower, but if I’m at work and my hands are flaky, I just go wash my hands in the bathroom, without drying them off! 2. Before your skin is dry, rub a tiny drop of Vaseline into it. Make sure to rub it in thoroughly so that every little bit is absorbed. If you are doing it individually on large plaques, you might notice that one pea-sized drop is not enough, so add one more. The key really is moderation – we’re not going for the gooey swamp monster look here! 3. Remember, Vaseline is safe (unless you’re allergic to petroleum jelly, which must be close to 1 in a quadzillion). As such, you can use it wherever psoriasis is rearing its ugly head, be it in between your bum or your face. It is endlessly versatile – just don’t use it on scalp psoriasis because it’s not water soluble and you’ll probably have to shave it off! 4. Do it at least twice a day, and increase that number if you can. Once in the morning and once at night is the bare minimum! Just remember, if you think you’ve tried using Vaseline, have you tried it the Right Way? 5. I’ve been on forums and talked to people who say it’s healed their psoriasis by up to 80%! I wouldn’t go that far, but I would say that it has minimised the scaling by a really great deal. I can’t emphasise the greatness of Vaseline enough – it has replaced all my moisturisers because, really, what can replace Vaseline and H2O for simplicity? Sure, you can get great herbal ointments, with Shea and hemp butter and the like, but using Vaseline for psoriasis is the “classic” way. Have you tried it? Let me know down below! What’s your flavour of Vaseline? Mine, at the moment, is the one with cocoa butter. My skin just eats it up! Some flakers say it works better than the original and while that’s up for discussion, the cocoa butter smell alone makes this a winner. Plus its like the cost of an extra large latte, minus the calories! Hello everyone, I suffer from inverse and plaque psoriasis; however, not on my scalp. I found my ‘go-to’ before I knew I had psoriasis… I do not use soaps in my affected areas. For my plaque areas: After showering in warm not hot water, before towel drying (if I leave extra time I skip and air dry only) I immediately use baby oil with aloe vera, followed by Vaseline (use wet hands to apply) then regular moisturizer. Be careful about moisturizers. I use baby lotion on arms and legs only. Doing this every day for 10+ years prevents my flair ups. It’s literally been that long since I’ve had a flare up on my face. If an area even feels dry, I reapply one or all through out the day. For inverse areas: Mild soap or water only. Dry inverse areas completely. I have used sensitive skin formula anti-perspirant on these areas (under breasts or ‘ahem’… upper thigh areas) when they are not flared, as prevention only. I do not recommend this step if you are inflamed nor do I recommend use in genital areas!!! In summer a rinse off in water as soon as possible if I sweat followed by drying of area and more anti-perspirant. So for inverse keep dry, for plaque moisturize. I’ve found not only does this help my psoriasis but my skin all over has improved and my skin ph balance has corrected itself. My boyfriend, who confessed he suffers from psoriasis of the nether regions brought me to this page. I hope I have helped some as some of the advice I have found will probably help my boyfriend as well. Good luck everyone and update what has worked for you! I have taken enbrel for years because of the arthritis, but it doesn’t do anything for the skin. weird how different things work or don’t for different people. here’s hoping for personalized medicine! I agree with others on this thread about avoiding the biologics if you can – the effect on my immune system overall makes things difficult, even though it does reduce the pain from arthritis. But it’s a very serious trade-off i hope others don’t have to make. I hadn’t thought of vaseline for scalp though, which is also a problem for me. Definitely going to try it… So thanks!!!!! Great to hear so many success stories, however theres always one, so here goes. It put vaseline on the soles of my feet which is the worst affected part of my body. Within an hour – my feet felt hot and upon inspection, i saw the bottom of both feet full of blisters. Sore to touch let alone walk. I immediately washed it off. I have patches of psorisis on my legs, elbows and now arms. Dovobet cream calms them down when used regularly – but ointment is small yet expensive. I am now hesitant to try vasaline on my legs – just in case?? It still works for me, but I am very careful NOT to get vaseline anywhere near the inguinal region. I also use a version of vaseline that is not pure vaseline. The version they call intensive care, cocoa radiant. (They have this cream in a spray-can that is able to spray very thin layers, you could try this on your legs). It is easier to get on and off. Although I get a rather thin layer of vaseline, it still traps heat quite well. So if I use it on my scalp psoriasis now in the winter, I do not need to use a knitted hat. (prepper tips…) Even if the intensive care cocoa radiant is able to spray very thin layers, I don’t think you could use it on a sensitive region like your feet. I would never use the spray on the inguinal region myself. My father has some weird patches on his legs that looks like psoriasis sort of, but not really, so I gave him a bottle, but he made the same complaint like you. Itchy and a weird sensation. If you try, try with the vaseline spray variant. Easier to control the amount, not so thick layer of vaseline, and easier to wash of. Personally, I can feel a sort of sticky sensation, but it beats psoriasis any day of the week. Hi Jack. I read your blog post a few months ago and decided back then to give vaseline a try. (I’ve tried many things for the last 25 yrs – prescribed and not). By chance I grabbed a cocoa radiant on sale, and used that instead of pure vaseline, (since I could skip the watering step with vaseline + lotion). And now I am daily surprised how good my psoriasis looks. It doesn’t heal, but the skin is so faintly color shifted it is barely visible to the human eye. It feels great. I’m very grateful for your blog post. Thanks! I went to an indoor swimming pool, and realised I forgot how it felt not having people look at my psoriasis. That was the first time I really grasped that people can’t see my psoriasis anymore. I guess it is still there, I can see the edges of the patches – if I look closely. I can live with that. This worked really well for me. Thanks again! After discovering that Vaseline was a miracle healer of my scalp psoriasis, I googled it tonight and found this thread. So great to see others have also found this inexpensive cure compared to all the prescriptions that contain cancer causing metals inside them. I’ve had no problem washing it out and I have a lot of hair! Thanks for sharing. This tip should be on Dr. Oz. I started to drink ACV three days ago and am now thinking of applying it to the red patches around my neck. Over ten days in hospital but no visible improvements at all…It keeps growing and growing I feel like I’m gonna eaten by it. Got really scared. Even started to take acitretin yesterday…Can’t go out without scarf and mask. Can’t meet people. Can’t bear looking at myself. I need a miracle. I’m also a Vaseline user for 2 years. And yes, it really worked on my psoriasis.. Then I read this blog.. I have the same story with you dude.. I tried different ointments etc. Until I tried Vaseline. Hi guy’s ive had psoriasis for over 8 yrs in that time in summer i cant wear dresses or shorts n t-shirt cos im embarrassed. I cry when i look in the mirror. Im only 31yrs old.. I had it b4 i had my daughter. Then it went away, when my daughter was 1 yrs old and we moved house it came straight back, ive done everything in australia, and now im suffering from it real bad atm. Ive spent thousands of $$$$$ on medicated creams that hardly work. Some days i cant sleep cos it hurts. When ever i exercise it goes Red, im now gonna try vaseline. Redblob can you help me i wont it gone. Hi guy’s ive had psoriasis for over 8 yrs in that time in summer i cant wear dresses or shorts and t-hhirt cos I’m embarrassed. I cry when i look in the mirror. I’m only 31yrs old.. I had it b4 i had my daughter. Then it went away, when my daughter was 1 yrs old and we moved house it came straight back, ive done everything in australia, and now im suffering from it real bad atm. Ive spent thousands of $$$$$ on medicated cream that hardly works. Some days i cant sleep cos it hurts. When ever i exercise it goes Red, im now gonna try vasoline. Redblob can you help me i want it gone. Hi I’m Chen, I’m struggling for psoriasis almost half of my life until now. I also tried different kinds of ointments and tablets but still it flares up in no time and its very difficult to deal with it. I hope PJ would help to relieve my psor I just bought it today. I accidentally went on this site and I read about all about this, I hope PJ would help everyone who suffers the same. GOD BLESS. Thank you Patti for your comment. I’m a little less nervous about trying it on my scalp now. You all are facing hair fall due to scalp psoriasis? I just wanted to write a little something somewhere on here to say how grateful I am to have stumbled across such an amazing website! ‘Redblob’ I love the way you write hehe I think we should get married 😛 But no, seriously, a very big thank you and long may this be available for people to browse and to be a part of too. It’s brilliant work and of course in sharing your life experiences, etc., and in providing this platform I am sure you are helping so many people. I am going to give the Vaseline a go and as directed above though I have to say I tend to use only Dermol 500 and find it is pretty good for both moisturising and for washing with. I haven’t seen it mentioned anywhere as yet (although I haven’t read through all posts) so thought I’d give it a mention and to see whether anyone has any thoughts on it perhaps. hi. great article. I was wondering though, what about a moisturizer or body oil and then Vaseline to seal it all in? That’s a good idea! I’m always in a rush in the morning so I try to keep it to a bare minimum, but that might work even better! dont know whats wrong with dat. do you still use plain vaseline for face or smth ??? Hey mate. Crusty eyebrows ain’t fun! I still use it on my face, just a tiny pea sized amount, mostly around the corners of the eyes and sides of the nose, where I tend to dry up a bit. Good luck! I’ve recently been affect by psoriasis. I’m currenty using vaseline for the affected areas. The flakes are gone… hooray… but now theres another problem. The affected areas are turning dark red.. is it normal? I also discovered that there are red tiny spots developing around it. Am i doing the right way or i done it all wrong. What else should i look out for? Can someone advice me what to do? Usually a dark red reaction is good, that might sound weird but it’s a sign of repair! Try to avoid things like hot pepper, milk and cheeses like those blue funghus ones, like Danish Blue or Camanbert. Avoid stress and tension and get out into the sunlight as often as you can, the Sun is your friend! I’ve had psoriasis for over 8 years, 3 months into uv-B therapy and my skin is looking like an old newspaper, spots are gone but you know how it is, it’s still there any second of the day, the itch! Tried Vaseline Spray ( the micro droplets one) and wow when i get those itches i spray it on and instant relieve!. Never had this good of a result before after trying everything i could get my hands on to find some relieve. This stuff is awesome i highly recommend it! 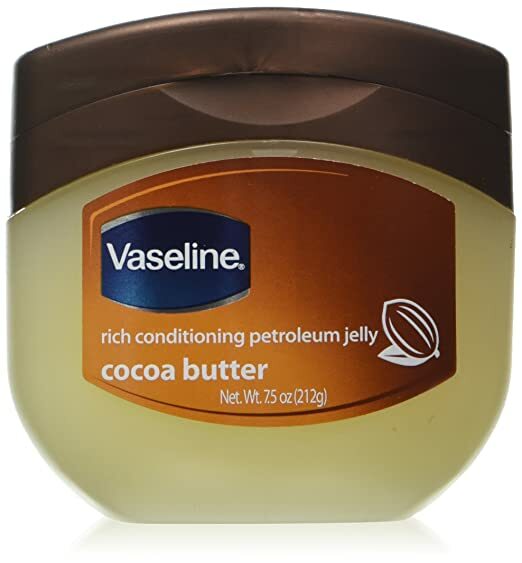 WHICH WORKS BETTER PLAIN Vaseline OR Vaseline WITH Cocoa butter. Does it,get rid of the redness. Mine is so dark red. You will never get rid of the redness,the only time i noticed when the redness went down i used cortizone cream. But the more you use it the less it helps like the skin is getting immune to the cream. So i tried alot of things like zinc cream, cream based on dead sea salts( my basic thing it helps alot) and more that you can imagine. Now there is a vaseline spray on the market that does me more good that anything i’ve ever used. It cools down the itch and protects the spots from getting worse. Best is it helps instantly and takes only 30 seconds to dry in without any additives like alchohol.. I just started using vaseline I remembered my mom using it on all kinds of things. So I thought why not try it on my psoriasis and to my delight it is working. I will do the water thing though I am having results. It is a bit tricky but I manage to apply it to my scalp and it helps. I am 60 years old and have been experiencing this for 1 and half year. It has been a nightmare I finally see light at the end of the tunnel. Hi marcellius, sorry for the slow reply. I get round to things eventually. I think trying it on your face is fine and you’re right, always apply vaseline on skin that has been wettened first. Your plan to wash it off after 6 hours is good because vaseline is occlusive. It doesn’t clog up pores in my experience but it can’t hurt to wash your face with a bit of warm water after wearing it for a quarter of the day. I think I must agree. I have tried a tons of different creams, but one of the best was a vaseline with calendula. I am empty, so I actually bought some pure vaseline to try today for the first time since I suspected it was vaseline I needed. So when I searched on the internet for psoriasis and vaseline, I found your blog. I am glad I found it, and will check out the rest of your posts. Thanks! I used Vaseline correctly on my scalp psoriasis and the flakes disappeared by 98% in two days. Its a miracle, the flakes where just not there anymore. I tried rubbing Vaseline on my scalp after my shower when the scalp is a little bit still moist. It simply worked for me after trying all sorts of scalp ointments and creams. I am so happy. And the Vaseline seem to be dissolving the ones at my lower back. I cant believe the treatment is so cheap after spending all the money I did in the past. I am an African man with black skin. Many thanks to the author and I pray my review helps someone else. God bless you guys.. Awesome news CJ! Crazy how much more effective vaseline can be for psoriasis with a bit of water. I used to use it dry and it was essentially a pointless endeavour. To the author, you can find fresh aloe in your grocery store. Replace water with aloe and use it with your vaseline. Just a tip. Too bad I cant use vaseline on my scalp psoriasis. Going to get tougher treatment when I’m done nursing my child in 6 months. Tired of it. Dealt with it since 2009 or ’10. Hi Jo, in my experience, yes Vaseline will ease the redness and pain. You need to put it on whilst your skin is still wet and pat dry. You will also need to try to identify what is making your skin flare. Look at what you ate a few hours before, or the day before. It’s sometimes trial and error to find this out. What have you eaten differently recently? Do some research on the nightshade food family (which is my personal nemesis food group). Also coconut water and instant coffee set my skin off terribly. But that’s just me. Jack’s blog about milk thistle tea bags and adding turmeric to meals has really helped me – thanks Jack! I’m still not completely free of it, but it is now under control for me. Good luck. Marie. Hi, how do you all reduce the redness of the skin will vaseline do that or do I need something else. This is my second outbreak and it is quite severe. I just heard about using Vaseline for psorasis so thought I’d give it a go and after following the advice here I get instant relief from the itch and it really calms down. I’ll be sticking to this method for a long time to come. Thanks! I too have used all kinds of creams to clear my Psoriasis. My best relief comes from none other than Vaseline Petroleum Jelly. I cleared it up before and after coming back this year I’m once again getting relief from Vaseline. It really works! Want proof? Try it! Hi, as a fellow flaker I love your website and thank you for its creation as it has been invaluable for me. I love my flake free skin now that I am using sea salt, mud soap and vaseline correctly! Its my second day on the tumeric tablets so looking forward to nice new pink skin! I have long sworn by petroleum jelly as a way to keep patches at least somewhat tamed, but I’ve never been able to feel totally comfortable with the idea of slathering myself with a petrochemical, however benign and beneficial it may be. Olive oil, coconut oil and vitamin E oil have worked fairly well, but they all lack the protective staying power of the petroleum jelly. Enter: WAXELENE. It’s an all-natural alternative to petroleum jelly, made with organic soy oil, beeswax, natural vitamin e oil and organic Rosemary oil. I’ve found it to be allllllllmost as protective as the petroleum jelly (thanks to the beeswax), with the added benefit of providing a bit of moisture and the healing and calming benefits of Rosemary essential oil. The stuff is so readily absorbed that I’ve begun using it as my primary post-shower, all-over moisturizer (except for my face). Several weeks in, I’m totally sold on the stuff. Petroleum jelly will always have a place in my arsenal, for urgent care of severe, localized flare-ups; however, for my everyday maintenance routine, Waxelene wins. Thanks for the recommendation Kate. Will have to give it a try. One good thing with vaseline is that you can get it…. anywhere and everywhere! Thank you so much for this Kate. I try to avoid petroleum products all together, so I will try this! Vaseline is such a great barrier cream – but the petrochemicals worry me as well. I Have Psoriasis On My Hands And Feet Mine were so Badly Cracked and Sometimes Bled.. I was At My Wits End Untill I Tried Vaseline.. Every Nite Before Bed I Would Apply It And Then I Would Wrap Effected Area with Saran Wrap Then A Pair of Tight Fitting Socks.. Honestly I Was So Shocked The Next Morning When I Uncovered My Feet.. It Had Cleared Up Almost Over Nite.. Vaseline Is Like A Miracle Helper To Me.. I Was So Amazed How Quickly It Worked.. If You Want To Get Help And Something To Help You See Results.. Try Vaseline It Works!!!!! You Wont Be Diappointed..
Hi everyone, I have also accidentally discovered that Vaseline is excellent for psoriasis. I have noticed something very strange though. Wherever I use it, the patches that I cover begin to migrate to an area not covered in Vaseline. This happens over the course of a few weeks, but they definitely move. The skin left behind is perfect, no scars, no redness. Weird. Anyway, this is a fantastic website, so glad you took the time to create it and I’m going to try Milk Thistle tea next. I just randomly came upon your cool website about psoriasis! I had a flare-up on my hands recently, from being outside in the bitter cold too long, shoveling my driveway! My hands got so red and sore, and then felt hot, then later on the horrible deep down itching started! UGH! I was AMAZED too, when I used the organic apple cider vinegar on my hands, and the itching went away! It relieved that painful itching and my hands felt soooooo good! Vaseline does help too! That psoriasis is nasty!!! I hadn’t had a flare-up in a long time, until we got all this bitter, cold weather! Thanks for your fun and interesting website! I look forward to reading more! I am a 15 year sufferer. I am a believer in petroleum jelly on top of water. Wash with water, apply PJ, then wipe with a tissue. All else has failed and the topical steroids were a curse! Hi my name is Antonis/CYPRUS. Two years ago I started having symptoms of dry skin over my hands. Having talk that with my sister (suffers from psoriasis arthritics) I have visited a doctor and diagnosed psoriasis. I have tried a few treatments but nothing seems to work for me. Accidentally I used Vaseline to moisturise my hands. It healed hand psoriasis up to 90%. I’ve being using Vaseline since then regularly for the last two years and it really works for me. You should try it. I am Marcus, a 14 year old boy, I have just recently found these scabs on my right forearm, they are hard to explain. One of them looks like an ordinary scab, just a tad red, one of them looks like a flat ring with a red-surfaced skin colour, and I also have this one where it’s a red circle with a micro-scab (we’re talking 2mm) in the middle of it. I have researched psoriasis and found out that it is the cycle of skin cells regenerating, over a period of 28-30 days, that is sped up to just 4 days, rarely 3. A few days ago I also had this clear, small balloon-shaped spot, it was very small, now it looks like a red spot that is no bigger than what it previously was. – What type of psoriasis is this? Because me, personally, can not tell what it is. – Can I just use the Vaseline on it like I would when I have a dry lip. If you could help me out that’d be great because from what I’ve heard, people live with it for almost or even their whole life, it doesn’t sound like fun so if there is anything that you could tell me that’d be great. Oh and if you were wondering my psoriasis is dry but with no flakes. Oh and I forgot to say I use ‘Dermatological E45 Cream’. I have not stressed over much if your going to conclude that. Is it because I’m getting older, or I’m getting it because my dad had it and he is passing it through to me genetically? Thanks for writing in! I can imagine how worrying it might be for you – I developed psoriasis when I was 15 and spent years hiding it like I was a cave troll, unfit for human eyes. First of all, though, I would recommend that you go see a skin specialist, and take what I write here with a large grain of salt, as who knows, you may not even have psoriasis! From the sound of it, the area you’re describing as red but non-flaky could be guttate psoriasis, while the patch that’s a circle with a micro scab in the middle may be pustular psoriasis – MAYBE! The first one normally rears its head during the teenage years, which works out in your case, but it’s best to check with a dermatologist to confirm. Have you had any infections / colds / sore throats recently? In terms of Vaseline and E45, they’re both very safe for long term use and could bring you relief. If you go to a GP, they’ll most likely prescribe a steroid-based cream, such as hydrocortisone, which may work well for a short while, but their efficacy wears off in the long run. Make sure to read about all the associated side-effects, such as skin thinning! If it was genetic or not is hard to answer. Many people carry genes that should predispose them to getting P, but for whatever reason, it misses them. There is normally a trigger – such as an infection, or even puberty – which sparks it off, but it’s not a guaranteed science. All the best! My advice would be, if you do confirm its P, be upfront to your friends about it. I found that most people are generally very accepting as soon as you clear up that its non-contagious. Good luck! I am a severe sufferer, and yes I was originally pro for Vaseline on those nasty patches for many years. Then I found my Dr., whom I just love, he described me as being the worst case he had seen in his nearly 60 years of practice (yes he’s OLD!) He asked me if I got cold easy or sweat often, and of course I did! He told me to stop using the Vaseline, like any other sealant, because if you cover too much of the body with it, the body can’t breath. Vaseline is ok for small patches or just a little bit, but I was at nearly 90% my eyes, ears, nose, and even my nails. See your Dr. and ask about immuno suppressants, one of them should work if you’re a severe sufferer like me! Thank you for your comment. Vaseline overuse can be an issue, because as you rightly pointed out, it acts as a sealant, and when you take into account widespread coverage, I can see why problems can crop up. Just a question, how much Vaseline did you use? I normally find that people apply way too much. I have a small tub that’s maybe 50ml and it lasts for ages if used sparingly. A little goes a long way in this case. I’m glad to hear that in the end you found some relief! So glad to hear others are having success with Vaseline like I am. I have had psoriasis since I was in elementary school- I am now 54. I have only had it on my knees and elbows (with an occasional small spot here and there) until January 2013 when it flared up terribly and covered my arms, legs, trunk, and scalp. It was horrible and I lived in long sleeves and pants the entire summer. I was about to go on Enbrel when I got a lung infection (blessing in disguise). I stopped using all my topical steroids because it was too much to cover and they weren’t working anyway. My itching was so bad I covered all areas (except my scalp) in Vaseline at least twice a day. Not only did my itching go away, I am currently about 98% clear. No lie. I still have lighter pigment where my spots were but they are slowly blending. Not sure why it flared up, it could have been reoccurring lung “issues” that stressed my body – but I’m so thankful I didn’t have to go on Enbrel or any other horrible drug. I used it on dry skin and it worked just fine…. It has worked better than any topical I have ever used, and I think I have used them all! Thank you very much for your comment Wendy. What an inspiring experience. Hope it continues to work well for you. Wow, Wendy! I have thought about going on Enbrel once again as my Psoriasis flare up has gotten me the worse right now. I have just started using Vaseline-so I’m hoping it works and clears my body just as it did yours. I have had psoriasis for over 17 years and this is the simplest and cheapest solution I have ever used. I’m using Vaseline at the moment I have figured out that using it in a bath is the best way to get it into my skin – through trying it on dry and wet skin it’s best on wet! My flakes have reduced so much, it’s just the redness now that I need to get rid of! I’ve been suffering with this problem for 10 months now and have tried so many things, which either sting or cause me to itch really bad, and petroleum jelly is the only thing I can happily use to stop the flakes and the splits and cracking. I feel semi-human again now!